Thank you so, so much I am so happy and going for my celebratory meal soon!! 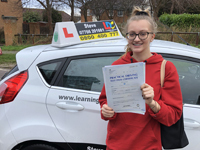 Steve, you have been an amazing driving instructor and I will miss our lessons lots: I will always keep you at the back of my mind when I drive telling me what to do, ha ha! Thank you so much you have been the best teacher and thank you for teaching me literally so well!!! 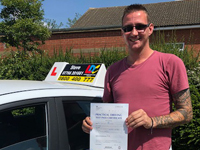 "WHOOP WHOOP"
Really pleased with my driving experience with Steve and the LD System he uses. 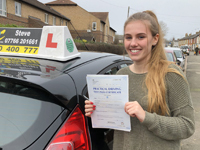 I passed my test quickly and at a very reasonable price! Steve is such a lovely man with a great sense of humour so lessons were a lot of fun. 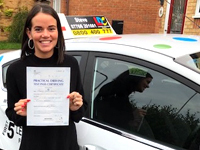 Super reliable instructor who is also flexible with lesson times!! I would rate Steve 10/10 and would recommend. Thank you Steve!! You have been a fab driving instructor and I couldn't have asked for anything more. You put me at ease straight away after a naff instructor previously. Thank you and yes I will promise to stay safe. Cheers Steve and thanks for teaching me what I needed to know to get through. You definitely get a smiley face and a thumbs up from me. 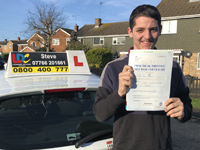 Steve has made my driving lessons very smooth and easy to follow. I felt at ease from start to finish and had no worries knowing we both always felt safe in the car. His instructions are very easy to follow and he tailors the lessons to focus on what are the weak points of your driving. I would recommend Steve and the LD System to anyone I know that needs lessons!! Definitely worth your money learning with him, "I'M SO HAPPY"
I am very pleased with the service I received from start to finish! It is always a positive attitude inside the car which massively helps when it comes to learning to drive. The LD System Steve uses makes it so easy when it comes to learning how your lessons will be planned and what you will be learning in your lessons. 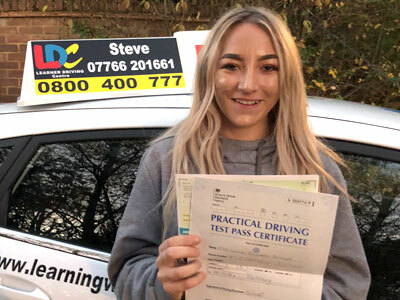 I managed to pass my test first time with such short time to have lessons only 22 hours. 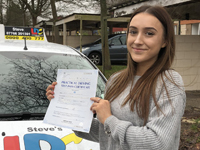 I really am happy with the service and more importantly Steve is a dedicated and passionate driver who will help anyone learn to drive well and most importantly how to always be safe! 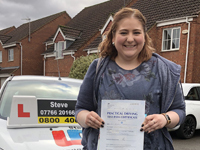 I had previously taken my driving test three times a couple of years ago and I had failed all of them so I decided to give up until a few months ago. That was when I decided to get back driving again and saw Steve on facebook and ever since he has helped me progress to a level I couldn't have reached without him. 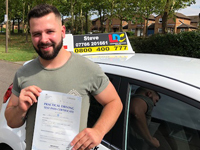 After having several previous driving instructors, I would say Steve is by far the best in Milton Keynes and as a learner, you get an experience that you wouldn't get anywhere else. As Steve told me from my first lesson with him, he's not just teaching me to drive and pass a test, he's also teaching me a life skill. 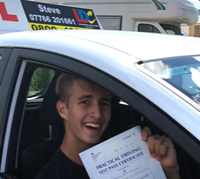 So thank you Steve, any learner will be lucky to have you as their instructor! I have just finished an intensive Midway Driving Course with Steve Clarke and I have many things to accredit him for. Steve visited us a month before the course started; my parents and I were immediately comfortable with him and the way he described his teaching style. Once the actual lessons started, it became even more clear that I'd made a worthwhile investment. Steve always made me feel safe in the car, even when I made mistakes. These mistakes were also dealt with calmly and positively - I never had to feel embarrassed or stressed about a slip up or a problem I was having trouble executing. Because of this I was always driving with a good disposition, which made learning so much more fun and easy. He always maintained a light hearted attitude and we would constantly crack jokes and share stories; In this way he was less like an instructor and more like a friend. From the start Steve told me that he wasn't only going to teach me to pass the test as anyone could do that but also teach me a life skill. Steve was very genuinely looking out for my future safety and cared mostly about making sure I wouldn't be in any danger, even after we parted ways. I know that I will always remember the lessons Steve taught me and that I'll be a safer driver for it. Steve Also helped me pass my test, first try, after only 4 previous days of formal lessons. So after having around 10 hours driving experience on and off due to bad experiences with instructors I decided it was time to start driving again. After my first lesson with Steve I knew he would be a great instructor. He is calm, patient and makes you feel comfortable from the get go. 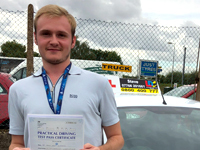 So I purchased a 20 hour intensive course and passed my test FIRST TIME. Never did I feel rushed or pressured into something I wasn't comfortable with. Being a biker his knowledge on road safety is top class and he is amazing at reflecting that knowledge onto you. I was driving 3 hours a day and I honestly never felt bored with Steve. He is passionate about his job and takes pleasure in watching you succeed! Top instructor and a top bloke! Thanks Steve!! I would like to say a massive THANK YOU to Steve Clarke for his amazing teaching style. Not only is Steve a top bloke he manages to relax you, so you can focus on your driving. His support finally got me driving and I passed my test today first time. it was an honour to pass with the guidance from a great man, a friend and an all round top bloke.